An urban garden has bloomed at the corner of Robie and Quinpool (Karen Raynard photo). A Common Roots Urban Farm orientation session ended with a ball of yarn spinning through the group. Each participant expressed something about themselves while holding onto their piece of wool as the ball passed person to person, forming a web, the gestation of a community. I grew up in rural Nova Scotia and lived an urban life the 22 years I have been away. Half those years I wondered how the gap between west and east coast, rural and urban could be bridged in my psyche and integrated into a physical reality. One season I volunteered for the University of British Columbia Farm’s market garden and became a certified master gardener from BC Master Gardener Association. But it wasn’t until I moved to this small city closer to my family that my life came full circle. Nine months later I was on the Urban Farm site, shovel in hand, reinventing myself. As the community plots were being built, participants groups were sowing seeds getting acquainted with the core team, with volunteers and with one another. We made outlines of plots, then filled them in with dozens of wheelbarrow loads of soil. We separated and organized donated brassicas, tomatoes and a myriad of other plants for future planting. Curious others popped by to see what was happening on the old Queen Elizabeth High School site. The 2.5 acres of grass lay dormant over the winter and by June this part of the land was a beehive of activity once again. One time in mid-July (a day when it was nearly 30 degrees) Jayme Melrose, lovingly dubbed our fearless leader, suggested several tasks to do; one was dig a hole deep enough for the Common Roots sign next to the shed. I was game. I loosened the surface ground with a pick axe and shovelled soil into a pile until I met with crushed concrete of the former school. I put my 5'2", 125 lbs of heart and soul into digging the two-foot hole for two and a half heat-drenched hours. It felt like I had dug a hole the size of a barn. I only got halfway. It was a source of amusement for folks at the farm. As a host volunteer I went through the Capital Health application process including a criminal records check and an orientation session. Hosts spend a three-hour block of time on the farm talking with members of the community along with performing farm duties. As the summer unfolded I made lovely connections with Haligonians and people from elsewhere. July was full of watering buckets, hoses heat, butterflies, bees, birds, herbs, flowers, veggies, coffee grounds, soil food web of bacteria, fungi, nematodes, mycorrhizae, protozoa and earthworms, which fuelled my imagination. Natal Day weekend I intuitively went to the farm with an idea to be incorporated into the art fence project - an initiative to create art spaces with the community on the farm. Others made clay bird houses; I made a clay image of the flower of life, a sacred geometric symbol believed to contain patterns of creation. This symbol is on the ingredient packages of the compost tea Hofman uses and will be placed on the poetry wall — a part of the art fence. On an overcast late September day I dumped a full bodied cloud of soil from the wheelbarrow onto a sunken bed of the market garden. It would take ten more loads to raise this bed enough for us to plant the cover crop alfalfa, the next row of fall rye, and then buckwheat. Melissa, another host, began harvesting tomatoes, kale, beans, peas, kohlrabi and zucchini. Now it is October and we’ve tagged plants for seed saving, begun building cold frames and row tunnels to be placed over sensitive crops. I’ve heard talk of a greenhouse this fall. We’ve begun meetings to plan for next season. We have invited the community to participate in enriching our compost by bringing their Halloween pumpkins to the farm for our big pumpkin smash on Nov. 4. The history of this land informs its future. 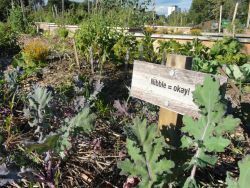 As a prototype urban farm the future promise of this space is a common grounds for education and healing. The farm is on health care land and it is appropriate to focus on a basic sustenance of life: good quality, high nutrient, natural food as a part of good health. Hippocrates, the father of medicine said. “Let thy food be thy medicine and medicine be thy food.” I am excited by the potential ripple effects of this project. 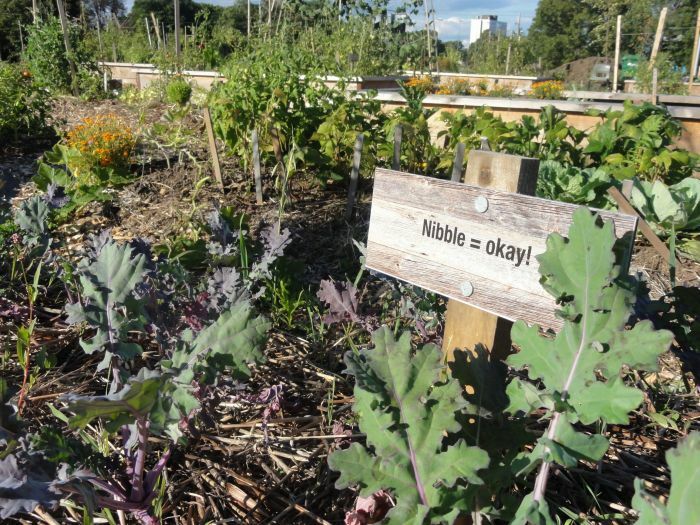 The ideal is community members create their own garden or farm in their own neighbourhoods.